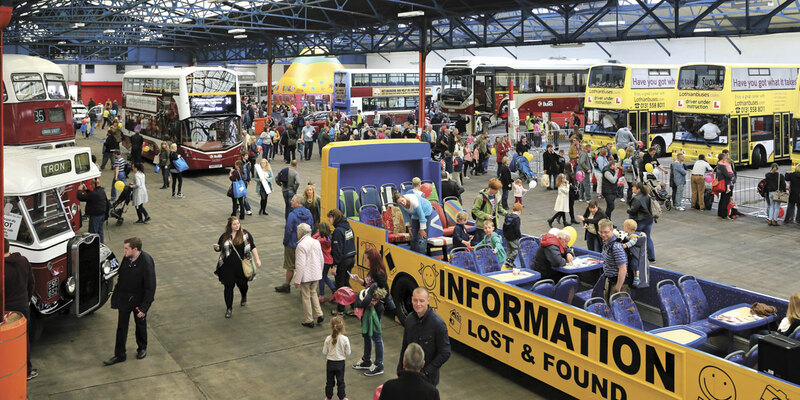 Lothian Buses has been an enthusiastic supporter of Edinburgh’s Doors Open Day, which gives the public the opportunity to explore some of Edinburgh’s most architecturally, culturally and socially significant buildings, for a number of years. Previously it has frequently featured a surprise vehicle to interest visitors and in 2015 went one better with two vehicles making their debut at Central Garage. 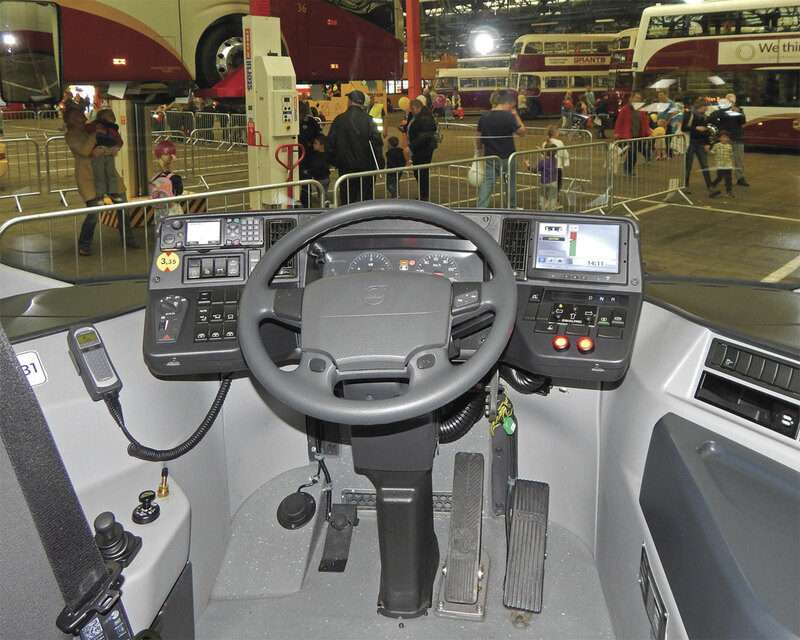 These were the first UK showing of Volvo’s electric bus concept vehicle and the unveiling of Lothian Buses’ newly converted cabrio Transbus Dart as an information centre and meeting point. 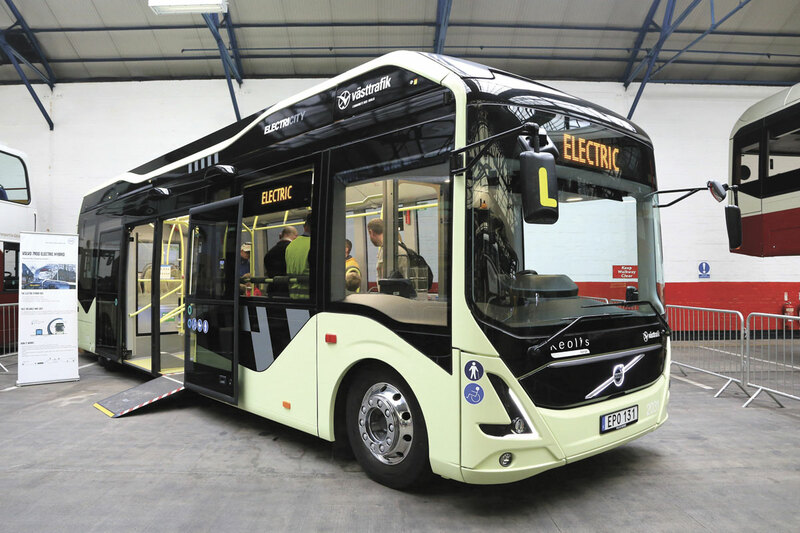 Bus and Coach Buyer has closely followed the development of Volvo’s plug-in electric hybrid and full electric vehicles introduced on Gothenburg’s service 55 through the ElectriCity project. Of the ten vehicles on this service, three are full electrics and it was one of these that made the crossing to Edinburgh on the Wednesday before the event accompanied by Volvo’s Hakan Johansson. He was joined by Adrian Felton, newly appointed to the role of City Mobility Manager within Volvo Bus UK. Both were kept very busy answering visitors’ questions about the concept of full electric power and the features that made the bus unusual to UK eyes, notably the central driving position and doors away from the driver. Visitors were also heard to comment positively on the arched ceiling and the jacquard-patterned wool fabric used for the seats. Two of the three full electric vehicles are scheduled for service in Gothenburg, the third being in demand for events and demonstrations such as the recent recording sessions with leading Swedish artists. Reliability of the vehicles was described by Hakan as very good since their introduction. Further software development will enable a battery pack to be isolated should it fail in service enabling the vehicle to continue in operation using the remaining three packs. Whilst in Edinburgh, the vehicle undertook a number of demonstration journeys followed by a three hour tour of the city’s streets. This reduced the batteries’ capacity to a level where maintenance charging was possible ready for the Doors Open event. 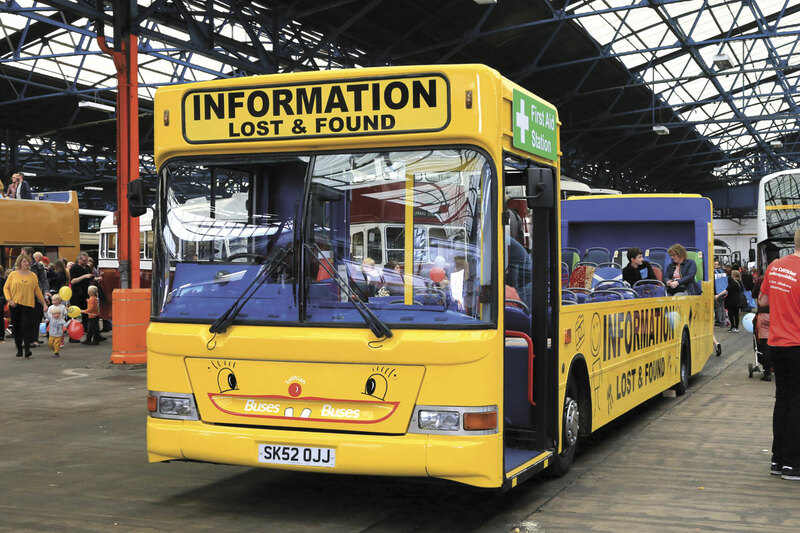 The bright yellow Transbus Dart cabrio greeted visitors just inside the depot, being described by Bill Devlin as a focal point where visitors could get information and be reunited with any family members who may have become lost within the events’ attractions. The 2002 vehicle retains full front and rear end structures but is intended for static use. To facilitate discussions with organisations using the bus, seating was grouped around tables installed in the low floor area. 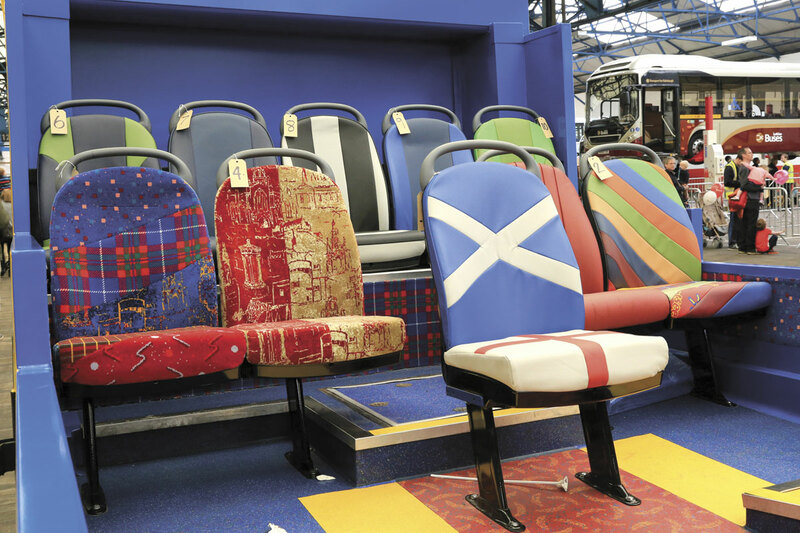 At the rear were a number of individual seats attractively trimmed in moquette or E-leather, one-off items being sold in support of Lothian Buses’ chosen charity, Fresh Start. 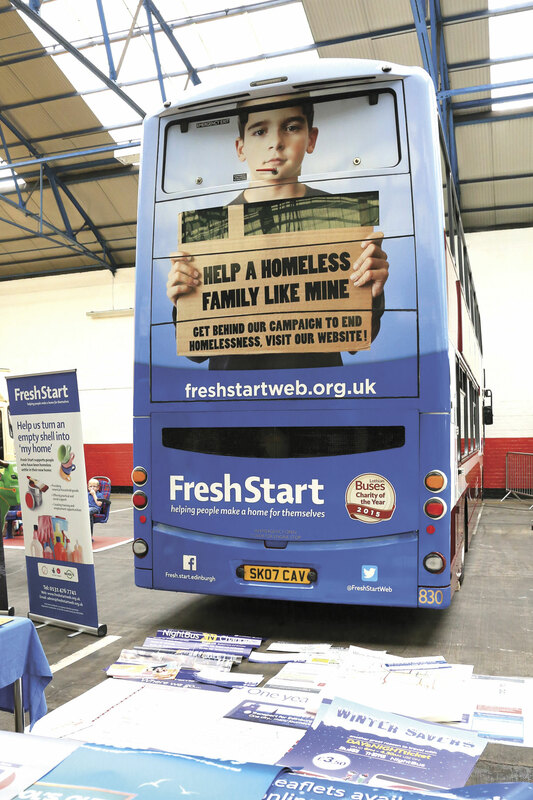 Edinburgh based Fresh Start was also supported by a request for visitors to bring along a selection of household consumables, the sale of souvenirs and donations at a range of attractions available within the garage. 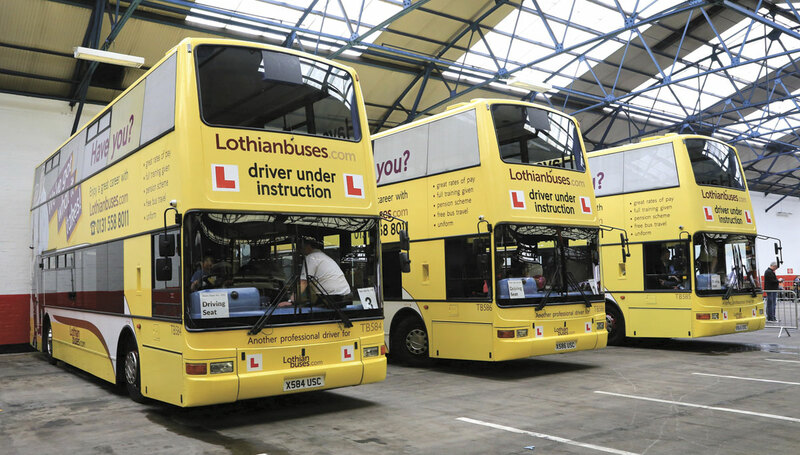 These included the driver’s seat experience using three of the Plaxton President training buses, remote control bus racing, a Volvo lorry experience, face painting and a bouncy castle. Trips through the bus wash on a Wrightbus Gemini proved as popular as ever and demand for open top tours of the complex required a third vehicle to be pressed into service, passengers on the latter being urged to behave otherwise they would also go through the bus wash! An onboard commentary was provided for the garage tours, explaining the history of the site and describing its current operation. Although looking at the front very much like a traditional bus garage, the building actually started life in 1922 as an exhibition hall, the cupola in the centre of the roof being a specific feature for this use. In 1926 it was acquired by the City of Edinburgh for use as a central transport depot. An extension in 1933 extended the building rearwards whilst the growing housing needs of the bus fleet prompted a further extension in 1963. This section, which incorporates the garage’s main workshop and fuelling/washing areas was built on higher ground to the east. A one-way traffic flow system is in use with ramps between the two levels. Central Garage is one of three depots housing Lothian Buses’ fleet and the only one that operates 24/7/365, covering the night and Christmas Day services. It houses around a third of the fleet which currently has a PVR of 598 vehicles excluding the various tour operations. 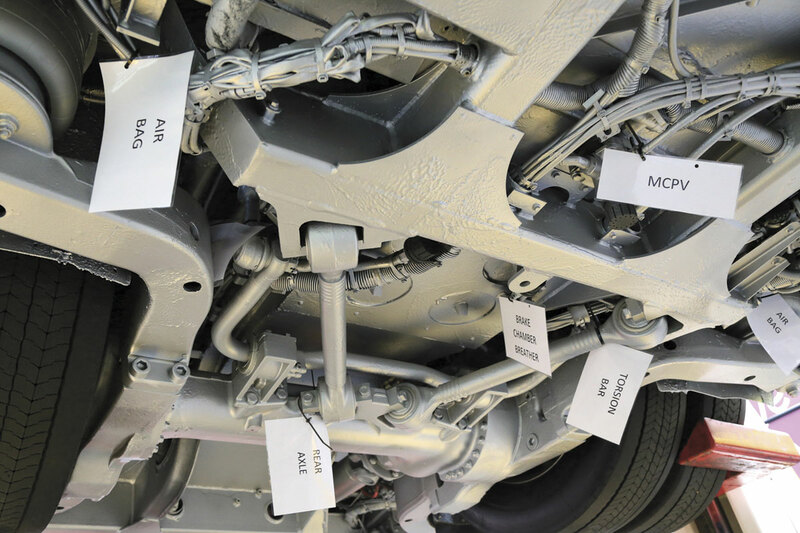 A selection of current vehicles were displayed, including a Volvo 7900H hybrid single-decker on Stertil Koni lifts with all the underside parts carefully labelled. The continued growth of the Lothian Country Buses was demonstrated by one of a number of Wrightbus Gemini double-deckers now carrying the operation’s green colours to provide additional capacity. One corner of the depot showed the evolution of the Airport service from Alexander Y type single-deckers to today’s leather seated Euro6 Volvo B5TLs with Wrightbus Gemini 3 bodywork. 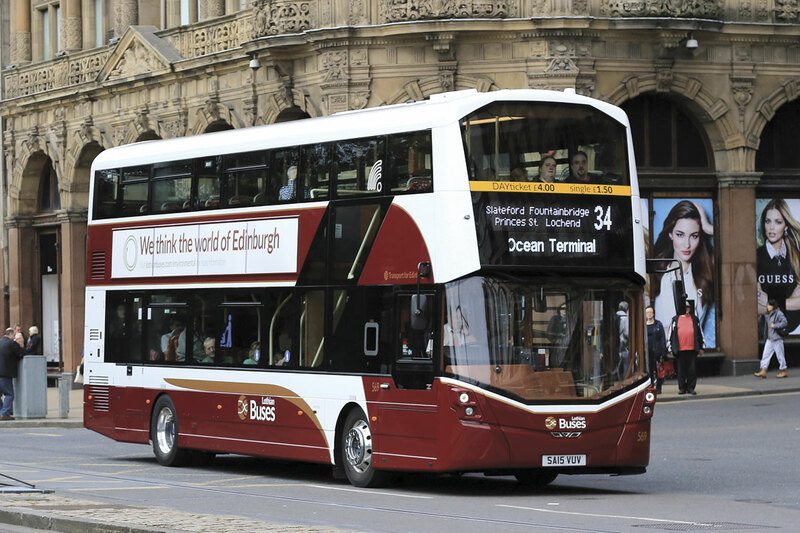 Air quality is a key challenge for Edinburgh and in addition to the proposed hybrid electrics, the company’s successes in securing Scottish Green Bus funding have seen the diesel electric hybrid fleet grow to the extent that the concept is seen as the norm. The latest deliveries, this summer’s 20 Volvo B5LH Wrightbus Gemini 3s with the latest frontal styling, carry standard madder, white and gold fleet livery. Deliveries in the past year have included 20 more Volvo 7900H hybrid single-deckers together with 37 Volvo B5TL Euro6 double-deckers including 12 for the Airlink service. 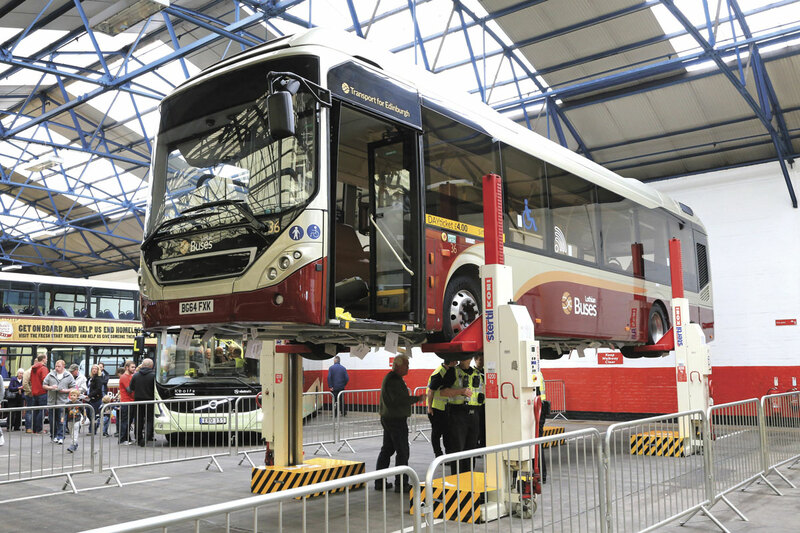 The displays at Central Garage were completed with a selection of Transport for Edinburgh infrastructure maintenance vehicles and seven heritage vehicles normally housed at the Scottish Bus Museum, Lathalmond. After the negative headlines which have dogged Lothian Buses in the last year, it was good to experience the positivity of a thriving bus operation with continuing investment in new vehicles and services for customers such as the new prepaid ‘citysmart’ card.